KISS i-ENVY Individual Lashes Classic Flare Medium (KPE02) provides a more natural look at the lash line. KISS i-ENVY Individual Lashes Classic Flare Short (KPE01) provides a more natural look at the lash line. Please note i-ENVY Individual Lashes Classic Flare Short (KPE01) is currently out of stock; Item will be available again shortly. Try comparable style in Ardell Duralash Flare Short Length or Andrea MOD Perma-Lash FLARE Short Length. 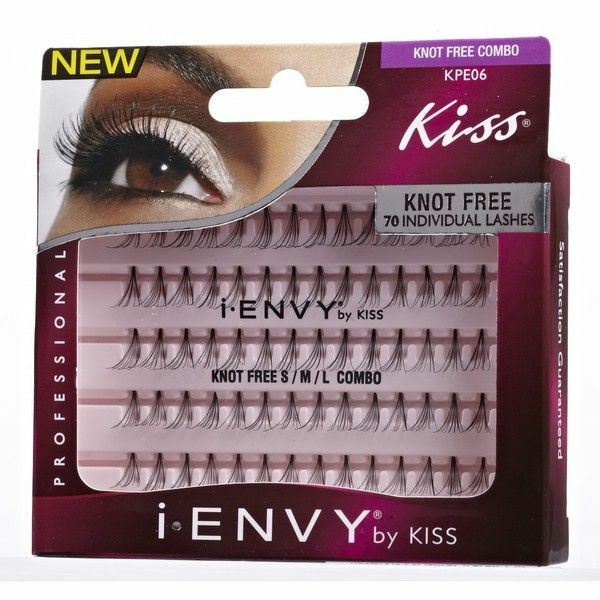 KISS i-ENVY Individual Lashes KNOT FREE COMBO (KPE06) BLACK provides a more sheerer, more invisible lash placement without knots. 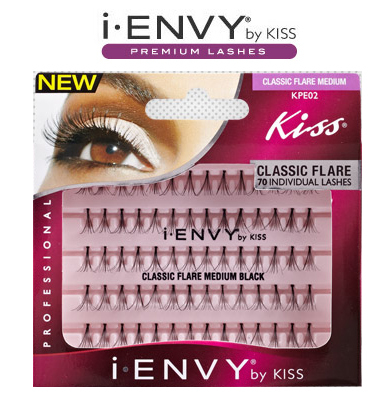 KISS i-ENVY Individual Lashes KNOT FREE MEDIUM (KPE05) BLACK provides a more sheerer, more invisible lash placement without knots. KISS i-ENVY Individual Lashes LUXE Black Long (KPE02B) are darker individual flare clusters that add definition, depth, and luxurious volume to your eyes as desired. The “Mini Knot” technology allows for a more natural look at the lash line. KISS i-ENVY Individual Lashes LUXE Black Medium (KPE02B) are darker individual flare clusters that add definition, depth, and luxurious volume to your eyes as desired. The “Mini Knot” technology allows for a more natural look at the lash line. KISS i-ENVY Individual Lashes LUXE Black Flare Short (KPE01B) are darker individual flare clusters that add definition, depth, and luxurious volume to your eyes as desired. The “Mini Knot” technology allows for a more natural look at the lash line. 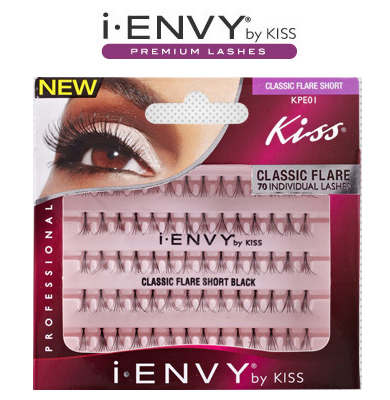 KISS i-ENVY Professional Individual Lashes KNOT FREE MEDIUM (PKPE05) BLACK provides a more sheerer, more invisible lash placement without knots. 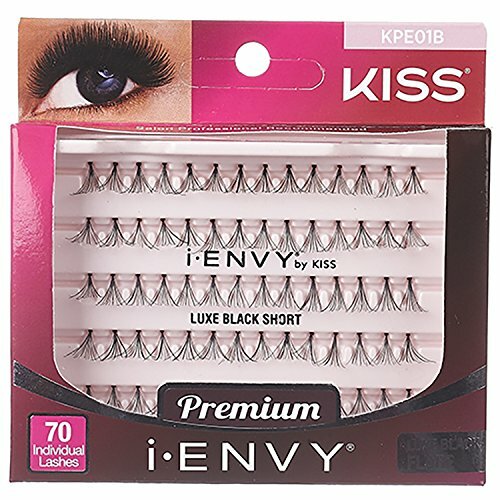 KISS i-ENVY Professional Individual Lashes KNOT FREE SHORT (PKPE04) BLACK provides a more sheerer, more invisible lash placement without knots. Kiss i-ENVY Professional Knotted Individual Lashes ULTRA Black Medium (PKPE02UB) have new innovative knot technology that offers 200% more volume than the regular individual lashes. Kiss i-ENVY Professional Knotted Individual Lashes ULTRA Black Short (PKPE01UB) have new innovative knot technology that offers 200% more volume than the regular individual lashes. Lash Extension Effect. Features flat roots for a more natural look. Holds 20 lash strands in each flat band. Easier, faster application with pro results. Tapered ends mimic actual lash.